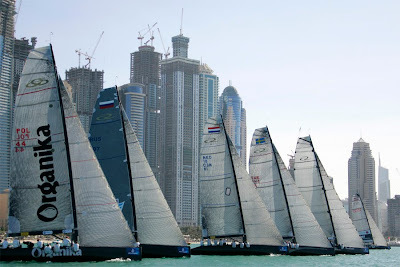 The fourth edition of the RC 44 Championship Tour will begin in Dubai on February 22 with the Al Maktoum Sailing Trophy. Terry Hutchinson and Adam Minoprio join the Class for this event. February 9, 2010 - The RC 44 Class Association announces a new and exciting program, as well as updated rules for the fourth edition of its Championship Tour. The teams involved in the Championship Tour 2010 include Team No Way Back (Pieter Heerema / Ray Davies), Artemis (Torbjorn Tornqvist / Terry Hutchinson), CEEREF (Igor Lah / Rod Davis), BMW ORACLE Racing (Larry Ellison / Russell Coutts), Team Aqua (Chris Bake / Cameron Appleton), Organika (Maciej Nawrocki / Karol Jablonski), Team Islas Canarias Puerto Calero (José Juan and Daniel Calero / José Maria Ponce), Katusha (Paul Cayard), Team Sea Dubai (Raimondo Tonelli / Markus Wieser), Team Austria (René Mangold / Christian Binder) and Team Jelik (Frank Pong). The RC 44 Championship Tour is one of the world’s top sailing events, and other teams are expected to join the Class throughout the season. Several rules have been updated in order to increase the appeal of the Class. For example, the events will now begin with the match race event on day 1 & 2. The third day will be a fleet race practice day as well as a spare day to conclude the match race if necessary. The fleet regatta will take place on day 4, 5 and 6. The long distance regatta is maintained; however it will only take place if an interesting race course is available. As for the points, they will not count double as was the case in the previous years. An official RC 44 World Championship will also take place for the first time in Lanzarote; it will break the possible ties in the annual rankings.